TenaciousSales makes managing the sales pipeline very easy. Create Multiple Sales people account and see their Status on Admin Dashboard. Automated lead reminders, leads assigning and missed leads status to manage and control your sales pipeline. Add comments and maintain conversation of leads to remind you about the talks you had with your clients. Assign leads to another Sales people if a someone is not able to attend the lead. Activate , Deactivate sales people account and see their progress. Very Easy to Understand the Customer Management System. Extensive features for completely free. Fetch all previous conversations, emails, comments and other details related to customers with a single click. Send Updated Newsletter’s and notifications with your Email List. 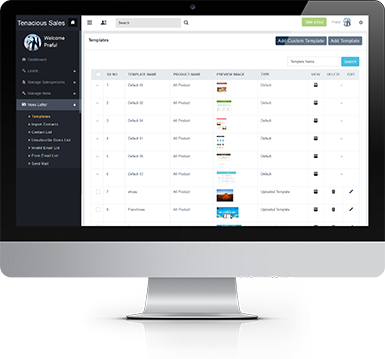 Manage multiple products customers and sort your customers as per your requirement. Check the customer accounts and updates with our dynamic conversation tracking. Get organized and let Tenacious Sales do all the work, while you just do the relevant data entry. Manage details like Customers Social Media accounts, best time to be contacted etc. Manage your sales lead on web and mobile. Entry leads on mobile or through web. Assign and track the progress of your sales person leads. Get notification and reminders when the lead is due. One of the best lead management system for sales people and small businesses. Give us your feedback if you like us to integrate more features. 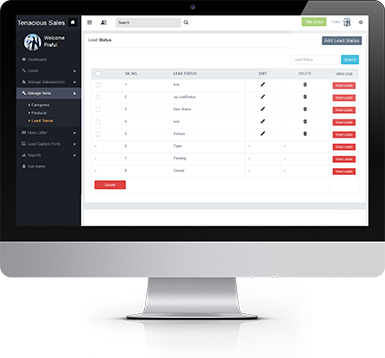 Import your existing customer’s database with .csv/.xls files or export Tenacious Sales leads to Excel to manage your contacts as you require. Simply follow the import format which we have provided to import your existing customer list. We love how mobile phones have changed the day to day operation of businesses. TenaciousSales mobile app CRM has been developed so that you can manage all your leads without a computer. 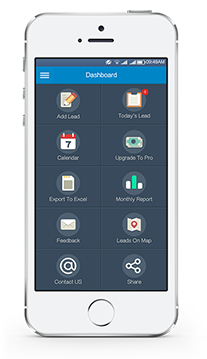 Our Sales CRM app has been natively build to make sure you get all the updates and notification with changing times. All you leads can be available to other phone if you change move your phone from iOS to Android or from Android to iOS. 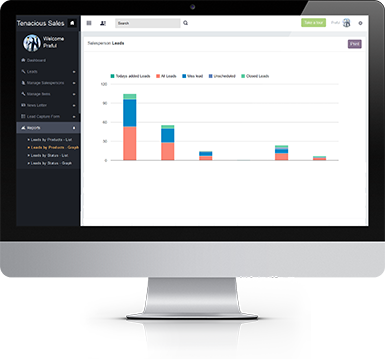 Sales Reports that are useful to monitor and visualize your sales pipeline. Identify which sales people are leaders and who are falling behind. Gather insights to improve your sales people by identifying their strength and weaknesses. 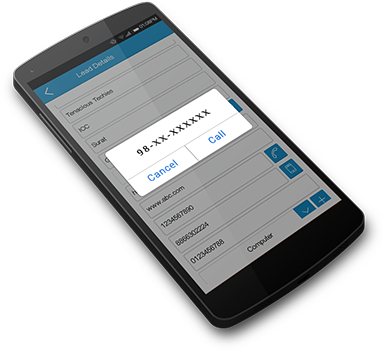 Make calls directly within TenaciousSales mobile app, Contact your lead and send updates to potential and existing client through a single click. Get detailed view of location wise leads on the map, using our exclusive feature for lead tracking. Use real time view to search for prospects and customers that are nearby. View all leads at a single hub, in the calendar and plan your sales strategies, allocate sales representatives accordingly. As an admin of TenaciousSales, you can send notifications to your team i.e. all sales people added in your account, with just a single click. Use our “Push Notification” feature to send constant updates and messages to your team on their mobile. TenaciousSales allows the account admin to upload a template which may contain your company logo. Send out messages that are virtual substitutes for a company letter head through email. Use our “Upload Template” feature to reach out to more customers with ease. You can track your sales person by sending request to your sales person's mobile.